The trip is featured with Maeklong railway market, Amphawa Floating Market, and many more. Take a motorized long-tailed boat to see traditional Thai life along the canal and stop at Wat Bang Kung, Wat Pumarin Kudi Thong. Visit Maeklong railway market, a large fresh seafood market, is located right by the Maeklong Railway's track. Lunch at a restaurant located beside the Maeklong river. Try delicious local seafood. Visit Ban Pinsuwan Benjarong Museum where you can find large collection of Benjarong, the Thai-styled ceramics painted in five colors with intricate designs, from the past to present. Move on to King Rama II memorial park. The park area was the birthplace of the King. Interesting features of the park are four Thai style buildings exhibiting art objects and expressing ways of life of the Thais who lived during the reign of the King. Check out Amphawa Floating Market. The market is opened only Friday, Saturday and Sunday. Take an exciting boat ride in a motorized long-tailed boat to see traditional Thai life along the canal. Stop at Wat Bang Kung; a temple since Ayuthaya period with a huge Banyan tree embracing the chapel with its roots. Then, stop at Wat Pumarin Kudi Thong; famous for its teak-wood chapeland serve as temple museum with antiquity preservation. Walking along Amphawa floating market, visit souvenir shops, old-fashioned toys, art postcards and clothing. 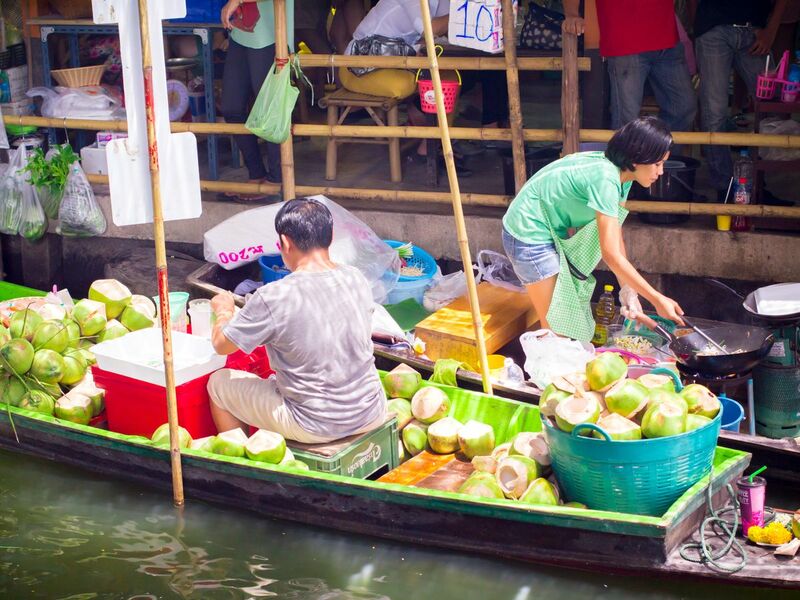 Taste Thai food, fruit, snack selling on the boat, and enjoy your time for taking photos and exploring the traditional market along the canal. Send you to the Maeklong mini bus station, then you will take a mini bus going back to Bangkok. This trip started from my intention to promote my home town to the world. I was born and living here. I know the areas so well. I will make you feel about visiting really local places, not only tourist famous places in Thailand. A hat, sun glasses and smile. Very professional. We loved this day trip and Suchada is very friendly and passionate about her home town.